Since its inception in 1975, Roberto Cavalli has always thrived on challenges, combining bold avant-garde and a deep respect for its Italian heritage. Today, Roberto Cavalli Florence, the brand’s latest line of perfumes, pays homage to the town that gave birth to the world-renowned fashion house. Florence is a peerless city, resplendent with beauty and sensuality. Surrounded by spectacular landscapes, this architectural marvel has been inspiring painters, poets and lovers for centuries. But if this jewel shines so bright, it may be thanks to the magnificence of the Tuscan light. 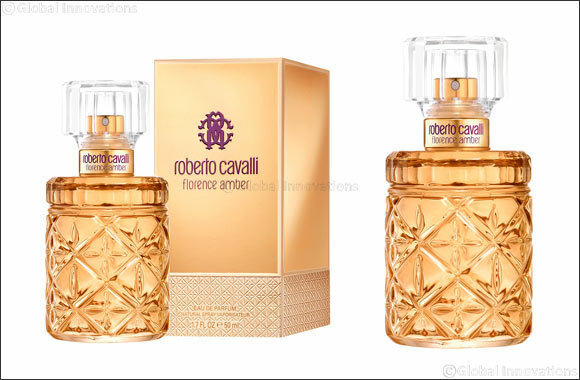 The Roberto Cavalli Florence Amber limited edition captures this unique radiance and transmutes it into a precious and addictive nectar. Bright, generous and highly seductive, it unveils a new facet of the Roberto Cavalli Florence woman. Bathed in this golden light, she exudes warmth and confidence. More glamorous than ever, she becomes an enchantress, fully in control of her powers. Like its forerunner, Roberto Cavalli Florence Amber was designed by master perfumer Marie Salamagne (Firmenich). A radiant chypre floral, it is a sophisticated composition, a clever and passionate tribute to the Tuscan light. Its striking opening is based on an evocative combination of Italian natural treasures: a note of Cypress refreshed by zesty Mandarin and Lemon essence. This delicate overture seamlessly segues into a second chord of fragrances that blends fruity Quince, Cashmere wood and Golden gardenia. The immaculate white flower highlights the perfume’s unmistakably luminous dimension. The core root note of balmy honey is facetted with Patchouli that brings a chypre counterpoint. Together, they create a refined and highly addictive trail that leaves no one indifferent. Faithful to the collection’s aesthetics, Roberto Cavalli Florence Amber retains its elegant bottle. The chiseled motives that embellish the solid glass are reminiscent of traditional Italian glassmaking. They play with the light, forming mesmerizing patterns. The amber tinge reflects the fragrance’s solar quality, contrasting with the collection’s signature purple lettering. The assorted box mirrors this contrast, combining a refined metallic copper finish with Roberto Cavalli Florence’s emblematic purple logo. The embossed lower part alludes to the bottle’s adornments.